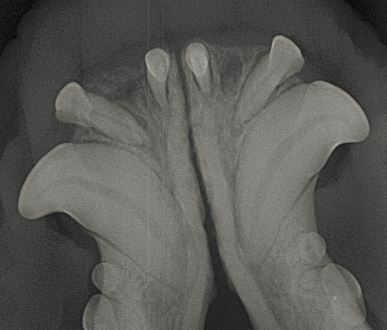 Pictured below is the X-ray of 3 year old, female Boxer taken during a dental evaluation. She sometimes bled from her gums, especially after chewing on hard objects. Her physical examination was normal except for one problem – she was missing two of her lower incisors. Incisors are the small teeth between the large fangs or canine teeth. 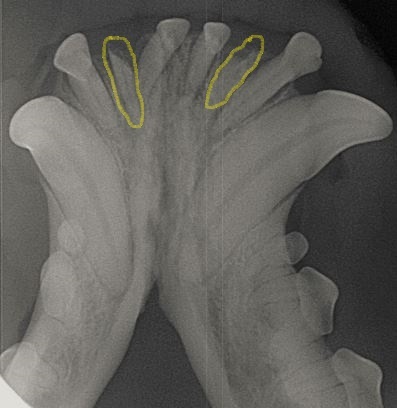 Normally, there are 6 incisors on the upper and lower jaws – 3 on the rights side and 3 on the left. Her family thought they fell out awhile ago. Study the image and then answer the following questions: 1) Identify the abnormalities found on this film? 2) Did the missing incisors fall out? 3) How is this condition treated? Diagnosis: Fractured Incisors. Crowns (Part of teeth above gum line) are missing but roots are still present. Fractured teeth are a common problem in dogs and cats. The crown of the tooth breaks off leaving the root still embedded in the periosteal bone. Anesthesia and dental X-rays are required to find this condition. These painful roots would have been missed if an anesthesia free dental was performed. Broken roots are extremely painful. They were removed, the bone was curetted to get rid of infection and the gingiva was sutured closed. Note on the post op film that the entire root has been extracted. It is important to remove the entire root, tip and all, to prevent infection and pain. This dog did very well after her procedure. She is backing to eating well, without any blood.